Guru Gobind Singh Indraprastha University (GGSIPU) conducts IPU-CET exam annually to grant admission to candidates willing to pursue MBA courses and other allied courses. For the year 2017, the last date to apply for the MBA Programme is 18 April 2017. The candidates who are interested in applying for MBA (IT) course must apply on or before 04 April 2017. A candidate must possess any recognized 3 years or more Bachelor's Degree in any discipline with a minimum of 50% marks in aggregate or Bachelor's Degree in Engineering, Technology or any other subject with minimum of 50% marks in aggregate or any qualification recognized as equivalent thereto with minimum of 50% marks in aggregate. The Application form is fully automated and the payment to be made ONLINE ONLY. Candidate has to pay INR 1000/- for each course that he/she applies for. 1. The Application form is fully automated and carries two forms, one for knowing the personal/general information and another one for knowing the course and payment related details. 2. A candidate has to fill in his/her general information for proceeding towards the course selection and payment section on the 2nd Form. 3. For filling in the general information for MBA course a candidate has to select Post Graduate Medical Courses / Super Speciality Medical Courses / Under Graduate Medical Courses /B.Sc. (Yoga). 4. First fill in your General Information and thereafter upload your recent passport size photograph and Signature along with the thumb impression as well. 9. If the candidate press CANCELS, he/she will be allowed to check and make modifications in their general and academic details. 11. After clicking on OK, another message box will appear asking candidate to note down his/her login id and password that will be used to login further or apply for multiple courses. 12. 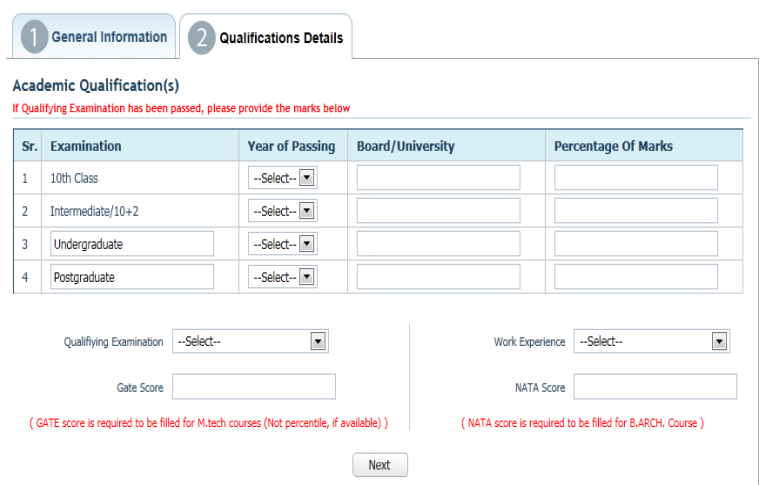 Candidate can go to the Course Application Tab to apply for courses and will click on “Apply for Courses” button. For more information related to GGSIPU, you can visit the official website as well.